Once again I have been busy enjoying all the fantastic, natural and free things Slovenia, and in particular the Gorenjska region, has to offer. A particularly enjoyable trip I made this week was to Galetovec (1265m). Though not high, the panoramic view from this peak, which stands above the village of Bohinjska Bela, is outstanding and well worth the effort. 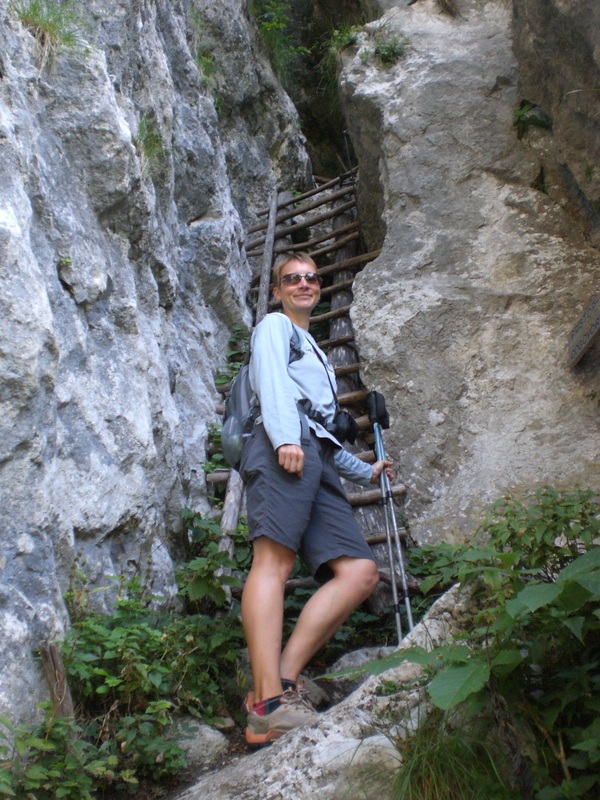 Bohinjska Bela is located just the other side of Bled, approximately 10kms from Radovljica. So, as it wasn’t far, and to avoid the usual summer weekend traffic jams through Bled, I went from home by bike. 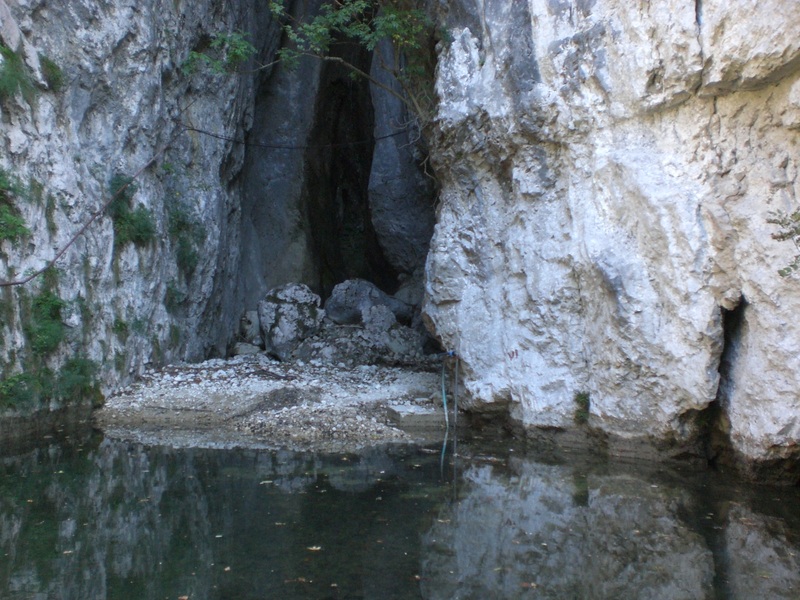 Though not the official start of the walk, I began my hike from the Iglica waterfall (Slap Iglica), which in the current dry season could perhaps better be described as the ‘Iglica Trickle’ – don’t expect too much! The area is a popular with local rock-climbers and there are ladders (as seen below) tucked into the crags between the rock faces. Those not keen on narrow confined spaces, would be better to begin the walk from the Mercator supermarket in Bohinjska Bela and followed the signed route. Both routes eventually join at a hayrack and lead onwards and upwards through the forest, quite steeply in places, passing the Slamniki highland, a Partisan memorial and eventually Galetovec itself, where you are more than rewarded with views across the valley, to the Jelovica plateau, the Karavanke Alps and, in the distance, the Kamnik-Savinja Alps. 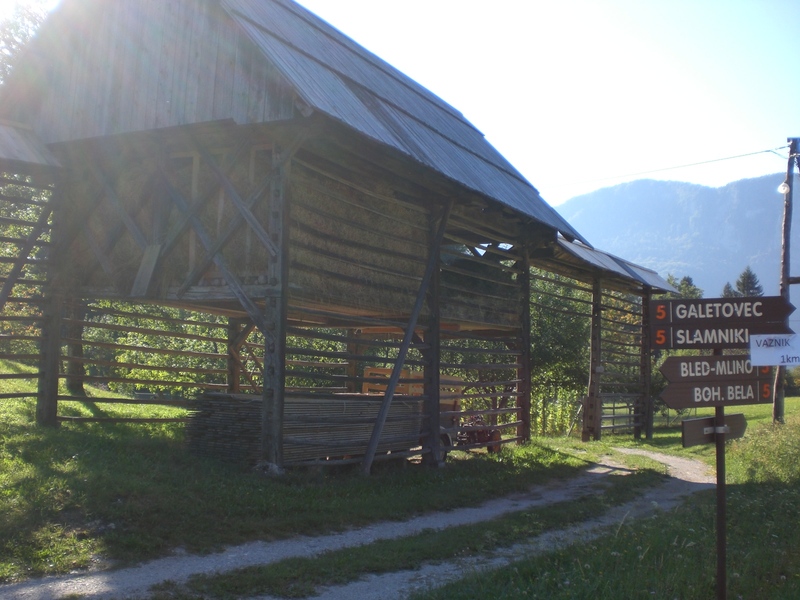 Hayracks (kozolci), used for drying hay, as seen in the picture below, are a typical feature of the landscape in Slovenia, with each region having its own unique variety. Wherever you are in the country, you will usually come across a hayrack. In fact, the worlds first open-air hayrack museum has also recently opened in the Dolenjska region – http://www.slovenia.si/culture/tradition/the-land-of-hayracks/ Unfortunately, these days all too often you can see advertising hoardings, rather than hay, hung on the hayracks, something I abhor but in these times of financial hardship, I suppose a much needed source of income for struggling farmers and landowners. On Tuesday 27th August at 8pm, there’s a free concert by the Kaboodle Community Choir in Linhart Square, Radovljica . On Saturday 31st August at 4.30pm it’s the annual Večno mladi (Evergreens) street parade through Radovljica. This year its a double celebration as the Radovljica Fire Brigade are celebrating their 130th year of existence. After the parade, at 5.30pm, there will be a concert featuring top Slovene music acts Čuki and Tanja Žagar. The concert will be held on the lawn behind the Spar supermarket and entrance is free. On Sunday 1st September a Flea Market will be held in Linhart Square, Radovljica from 9am onwards. Also on Sunday 1st September, a concert will take place at the church in Kamna Gorica. The concert, by Filip Kopušar, is part of the Langus Days Festival (Langusovi dnevi) which takes place annually on the first weekend of September to celebrate the painter Matejž Langus, and includes creative, recreational and cultural events for all the family.